The Clay Hill Jersey Dispersal will be held on the farm in Poseyville, Ind., on April 13, starting at 11:00 a.m. (CDT). Owner Jim Arnold has been breeding and selling Jerseys in local sales for many years, including supporting the Kentucky National Sale. This will be a complete dispersal, so there are all ages to choose from, from good production cows and heifers, to show age calves for 4-H projects! Take a look through the picture galleries of cattle to find the one or truck load that catch your eye, then join us on Saturday at the farm or on www.jerseyauctionlive.com to bid last on the strong cattle that Mr. Arnold is offering! 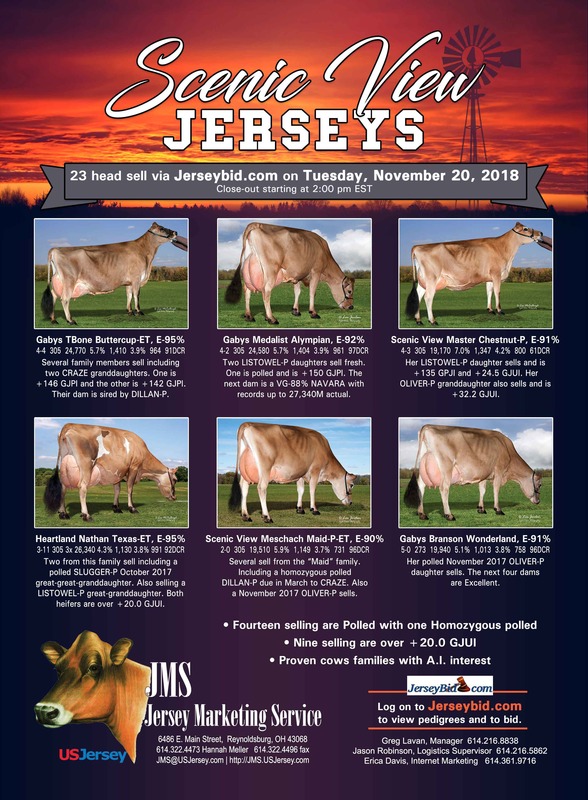 Scenic View Jerseys has announced they will be selling the remaining 23 head from their herd, online, ending Tuesday, November 20, 2018 at 2:00 p.m. (EST). The Leroy and Martha Sue Miller herd has been bred for deep cow families, high GJPI and high GJUI potential. Many of the consignments are polled. There are no JX pedigrees and no females selling with a bracket following their name. Cows and bred heifers will be the focus of the sale selection. Stay tuned over the next few days as pedigrees, pictures and videos are added to the bidding site, JerseyBid.com. The sale will open on Friday, November 16 at 9:00 a.m. (EST) and will remain open until closing bids started at 2:00 p.m. (EST) on November 20, 2018. Horse Race Style Extended Bidding on www.jerseybid.com will explain the close out process. Take a look at the sale flyer, highlighting some of those deep and productive cow families the Leroy Miller family liked to breed from and develop! The Buckeye Production Sale was recently added to the JMS Sale Calendar. The Wayne County Fairgrounds in Wooster, Ohio, is again our gracious host for this event. Close to 150 head are cataloged, with over 30 currently being processed for fly sheet additions, and featuring the dispersal of 70 head from the Rudy Hochstetler herd from Millersburg, Ohio. Consignments will be coming from great production based breeders in Ohio, Pennsylvania, and Tennessee. The sale will NOT be broadcast Live, but all sale personnel can assist you in handling bids if you are unable to make it on June 16, 2018 at 11:00 a.m. (EDT) for the Buckeye Production Sale. Watch the JMS Blog for more information and for pictures from the sale during the week prior.